This is a book which will give students the confidence to journey out into the exciting places of global English! 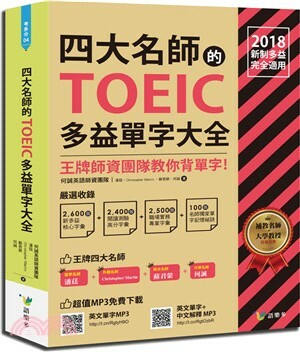 This is an excellent book for students working toward the TOEIC examination and for all learners of English who want to extend their knowledge of idiom and vocabulary. I am very happy to recommend it. The book is intelligently organized by theme and offers a wide-ranging view of the English language as it is spoken and written by native speakers today. It is this contemporary element especially, I believe, which will make Ashley Su’s book an inspiring and practical choice for the types of student I’ve just mentioned. Ashley Su is renowned as a popular and highly effective teacher at the university where I work, National Taiwan Normal University. I hope her text will be read by our students and by many others as well. This is a book for life, and one which will give students the confidence to journey out into the exciting places of global English. This book will make your English-learning journey fast, efficient, and hassle-free! In education, experience counts. Miki Pan has taught thousands of students English, so she knows what works and what doesn’t. She knows what students need and how to keep them motivated in English learning. She knows the time-tested methods of instruction, as well as the new cutting-edge trends. Just as GPS utilizes a broad base of information to get drivers to their destination quickly and smoothly, this book utilizes Miki’s broad base of English-teaching experience to help make students’ English-learning journey fast, efficient, and hassle-free. With the aid of this book, students can make very good time in their English studies and reach their ultimate destination: success!